Complete loading and unloading of railway wagons can be done significantly faster with telescopic forks. In practice, the resultant time savings are up to 20 percent. Previously, workers would have had to climb into the wagon and shift the pallets to the edge of the loading area with hand pallet-lifting trucks. They say this is a very labour-intensive job. With the new telescopic forks it’s all done in a jiffy. Extend the forks, lift, and take the pallets out. And the whole width of the wagon is clear, they say. At PanGas it is not possible to load and unload from both sides. That’s why one-sided operation with telescopic forks is the only way to achieve reasonable turnaround times. Meijer Special Equipment, a company in the Netherlands, was the first to develop hydraulically extendable and retractable fork prongs. Since coming onto the market in 1980, KOOI telescopic forks have earned themselves an outstanding reputation in the transport business. With two integrated hydraulic cylinders per fork prong and the integrated synchronization system, the manufacturers describe their product as the best telescopic fork on the market. 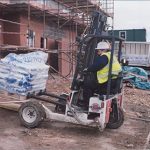 It is not only the much shorter turnaround times that speak for these telescopic forks, another essential factor is the higher level of transport safety. The synchronization system is responsible for this. For unequal movements of the forks are the biggest problem in the use of telescopic forks. They can lead to rotation of the pallets during loading and unloading. This is especially dangerous when, for example, working with double-deep storage-rack systems at height. Meijer Special Equipment’s unique self-controlling synchronization system guarantees 100% freedom of movement. Further advantages include better visibility, because fewer tubes are necessary and there is no external flow divider. This also makes the telescopic fork easy to mount. Even of the load is not sitting in the middle of the forks, uniform running is guaranteed. An external flow divider compensates only partly for unequal retraction forces. 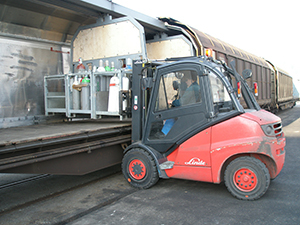 PanGas gets its empty gas bottles delivered by rail, takes them into the filling installation and loads the full bottles back onto the rail wagons. Scheduled times are to be respected exactly, because the locomotives don’t wait for the completion of the loading procedure. Both the forklift operators and the management at PanGas are enthusiastic about KOOI telescopic forks. That goes without saying, when it only takes one lift to raise three pallets.